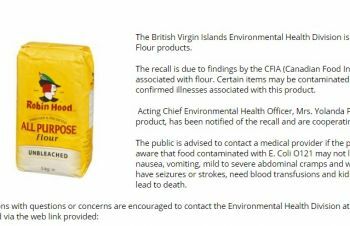 ROAD TOWN, Tortola, VI- At least one major supermarket on island confirmed to this news site, that they were unaware of a consumer alert on Robin Hood products recall, where the Environmental Health Department called on all to discontinue the use of certain Robin Hood Products or risk being ill. These products are: Robin Hood-Home Style White, Bread and Roll Mix, Unbleached, Blending Flour and All Purpose Flour, which according to the Canadian Food Inspection Agency website had been recalled since April 16, 2017. The local advisory came on Thursday April 26, 2017, ten days after, via a press release. The release added that to date the agency has not confirmed any illness associated with the product yet, however, persons should be aware that food contaminated with E. Coli 0121 may not look or smelled spoiled but can cause illness. Symptoms include nausea, vomiting, mild to severe abdominal cramps and watery to bloody diarrhoea. They warned that in severe cases of illness, persons may have seizures or strokes, need blood transfusion and kidney dialysis or live with permanent kidney damage. Severe cases can lead to death. E. Coli are bacteria that live naturally in the intestines of cattle, poultry and other animals and humans. Most are harmless to humans, but there are many different strains of E. Coli, some of which can cause serious illness such as 0121. Pregnant women, young children and older adults are most at risk, for developing severe complications, www.publichealth.gc.ca the Public Health Agency of Canada reported. Virgin Islands News Online called on different major establishments, one of them being the One Mart Supercenter that is currently having its month end signature sale where thousands flock in to take advantage of the special prizes, were not aware of the advisory. 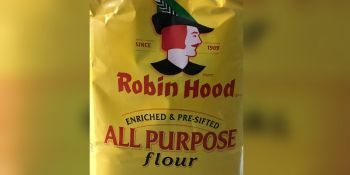 “Robin Hood Flour? That is news to my ears,” one high ranking official of the supermarket said. 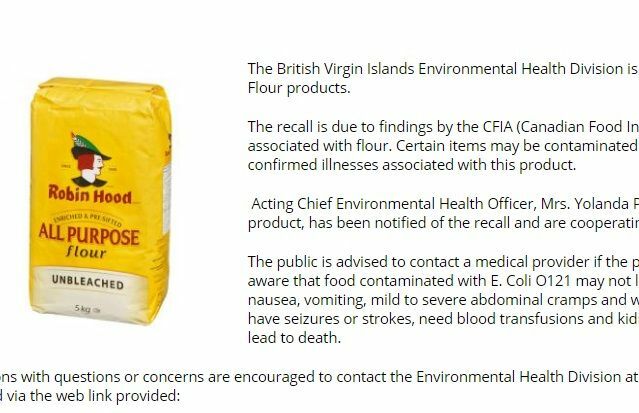 The Acting Chief Environmental Officer Mrs Yolanda Penn, the release informed, said that the main importer of the product, Road Town Wholesale has been notified of the recall and are cooperating. Before Rockafella brought Little Dix Bay & Hokin bought Bitter End Yacht Club our people who's to make their own whatever. That's a key reason why most of time live over 75 years and up. This new fast process with all the technology etc only been cause high risk on people lives. Leave the BVI alone. It's not too late to allow many to make a living here though. NO MORE SALT FISH AND DUMPLINGS FOR ME ANY TIME SOONER. @Afu, why give up something as good as salt fish and dumplings? Put some green bananas and sweet potatoes instead or use another bran flour and mix your dumplings with coconut milk. @Cherry Pie. Thanx. I got ya. Makes sense. Big up to ya!. I always used Gold Medal. People read the article and check your product. IT IS NOT ALL ROBIN HOOD FLOUR AND IF YOU HAVE A PARTICULAR ITEM SUCH AS UNBLEACHED, FOR CAKE AND PASTRIES, ETC. IT STILL IS NOT ALL. we kicked agriculture to the curb !!!! What is the code or Reference number for the affected products?? This's silly, is no way this bacteria will survive in a dry product as flour. E. coli is a germ, or bacterium, that lives in the digestive tracts of humans and animals. Now it can get into meat during processing. If the infected meat is not cooked to 160°F (71°C), the bacteria can survive and infect you when you eat the meat. And also in raw milk or dairy products, as well in raw fruits and vegetables and contaminated waters by feces. So flour mix with these about is it posible.